Are your eyeglasses streaky and smudged no matter how often you clean them? Try these tips to help keep them clear and smudge-free. If you're watching your favorite TV show, you may not want to make a trip to the bathroom or kitchen just because you noticed a smudge on your glasses. After all, why miss a key scene when the bottom of your shirt will get rid of that smudge or smear? Cleaning your glasses without any water can end up worsening the smudge or may even damage the lenses. Your shirt may feel perfectly smooth to you, but might actually contain rough fibers that can scratch your lenses. Clothing also tends to trap dirt. When you rub the fabric across your glasses, you not only transfer the dirt to your lenses, but also grind it into them, potentially damaging the glass or coatings. Your glasses aren't the first thing you need to clean. Dirt and natural body oils will be deposited on your lenses if you don't wash your hands first. After you wash your hands, rinse your lenses under lukewarm water to remove dirt and debris. Place a drop of dishwashing liquid on each lens after you rinse your glasses. Gently rub the lenses to distribute the liquid on each side, then rinse them again. Stay away from dishwashing liquids that promise to keep your hands soft. These varieties contain moisturizer that will only worsen smudges and streaks on your glasses. Glasses may look like little windows, but they're much more susceptible to damage than windows. Don't use window cleaner, ammonia or any other cleaning products you find under your kitchen sink to clean your glasses. Do you focus solely on the lenses when you clean your glasses and forget about the other parts? Ear pieces and nose pads can retain body oils and may eventually smell a little unpleasant if you neglect to keep them clean too. The next time you clean your glasses, devote a few extra seconds to cleaning the frames, temples, arms and nose pads. Hold your glasses under a stream of lukewarm water to rinse every trace of dishwashing liquid from them. If you just quickly pass them under the water, you may notice streaks due to residue from the dishwashing liquid. Use soft cotton or microfiber cloths to dry your glasses. Microfiber cloths are often provided when you pick up your new eyeglasses. If you don't see a cloth in your new eyeglass case, be sure to ask your eye care specialist for one. Paper towels, bath towels and other items may scratch your lenses and shouldn't be used to dry them. Although tissues may feel soft, they often contain rough fibers, just like your clothing. Drying your glasses with a tissue can also increase smudging if the tissue contains lotion. Cleaning cloths eventually get dirty. Wash your cloth regularly to ensure that it doesn't transfer dirt or dust on to your glasses. Many of us place our glasses on our nightstands while we sleep. 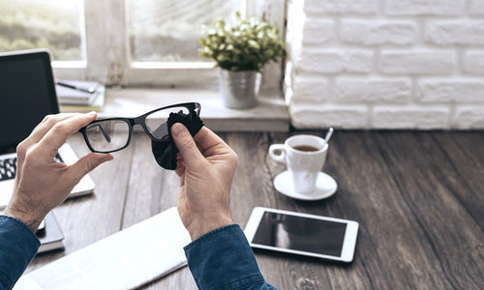 While this is certainly convenient, it exposes your glasses to floating dust particles. When your glasses aren't on your face, keep them in a hard case. The case will not only help you keep your glasses cleaner, but will also prevent damage if you happen to knock them off your nightstand during the night. Proper cleaning techniques extend the life of your eyeglasses and help you enjoy excellent vision. If it's been a year since your last visit, or your vision has changed, give us a call. We'll examine your eyes, provide you with a new prescription and help you find the ideal frames to accentuate your face. Ladd Eye Center is now accepting patients with VSP vision insurance. "Ladd Eye Center is absolutely a five star..."
"The Staff and Dr. Ladd were nothing short of amazing..."